Examples of the silk used in experiments to detect damage in composites, shown under black light. (Left) Ordinary fibroin of the Bombyx mori silk worm. The observed fluorescence is the result of molecules already present in the protein structure of the fiber. (Middle) Mechanophore-labeled silk fiber fluoresces in response to damage or stress. (Right) Control sample without the mechanophore. Consumers want fuel-efficient vehicles and high-performance sporting goods, municipalities want weather-resistant bridges, and manufacturers want more efficient ways to make reliable cars and aircraft. What’s needed are new lightweight, energy-saving composites that won’t crack or break even after prolonged exposure to environmental or structural stress. To help make that possible, researchers working at the National Institute of Standards and Technology (NIST) have developed a way to embed a nanoscale damage-sensing probe into a lightweight composite made of epoxy and silk. The probe, known as a mechanophore, could speed up product testing and potentially reduce the amount of time and materials needed for the development of many kinds of new composites. The NIST team created their probe from a dye known as rhodamine spirolactam (RS), which changes from a dark state to a light state in reaction to an applied force. In this experiment, the molecule was attached to silk fibers contained inside an epoxy-based composite. As more and more force was applied to the composite, the stress and strain activated the RS, causing it to fluoresce when excited with a laser. Although the change was not visible to the naked eye, a red laser and a microscope built and designed by NIST were used to take photos inside the composite, showing even the most minute breaks and fissures to its interior, and revealing points where the fiber had fractured. The results were published today in the journal Advance Materials Interfaces. The materials used in the design of composites are diverse. In nature, composites such as crab shell or elephant tusk (bone) are made of proteins and polysaccharides. In this study, epoxy was combined with silk filaments prepared by Professor Fritz Vollrath’s group at Oxford University using Bombyx mori silk worms. Fiber-reinforced polymer composites such as the one used in this study combine the most beneficial aspects of the main components—the strength of the fiber and the toughness of the polymer. What all composites have in common, though, is the presence of an interface where the components meet. The resilience of that interface is critical to a composite’s ability to withstand damage. Interfaces that are thin but flexible are often favored by designers and manufacturers, but it is very challenging to measure the interfacial properties in a composite. One option is optical imaging. However, conventional methods for optical imaging are only able to record images at scales as small as 200-400 nanometers. 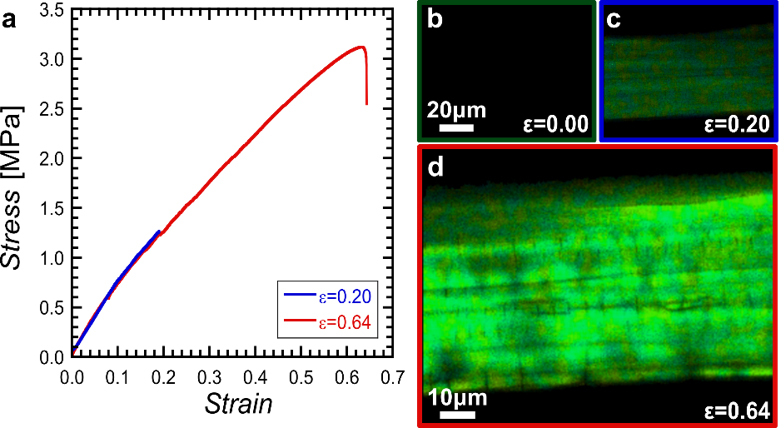 Some interfaces are only 10 to 100 nanometers in thickness, making such techniques somewhat ineffective for imaging the interphase in composites. By installing the RS probe at the interface, the researchers were able to “see” damage exclusively at the interface using optical microscopy. Activation of the mechanophore at the interface of a single fiber bundle silk epoxy by mechanical deformation. The NIST research team is planning to expand their research to explore how such probes could be used in other kinds of composites as well. They also would like to use such sensors to enhance the capability of these composites to withstand extreme cold and heat. There’s a tremendous demand for composites that can withstand prolonged exposure to water, too, especially for use in building more resilient infrastructure components such as bridges and giant blades for wind turbines. The research team plans to continue searching for more ways that damage sensors such as the one in this study could be used to improve standards for existing composites and create new standards for the composites of the future, ensuring that those materials are safe, strong and reliable. This research was funded through collaborative research agreements with both the Air Force Office of Scientific Research and the Army Research Office.